The lithium ride was a great one. Cobalt, too. All they needed was their Elon Musk moment, which came in the form of the Nevada battery gigafactory. The next Elon Musk moment won't be about lithium at all—or even cobalt. It will be for an element that takes everything electric to its revolutionary finish line: Vanadium. That's vanadium—Element 23. The answer to our issue of scale. 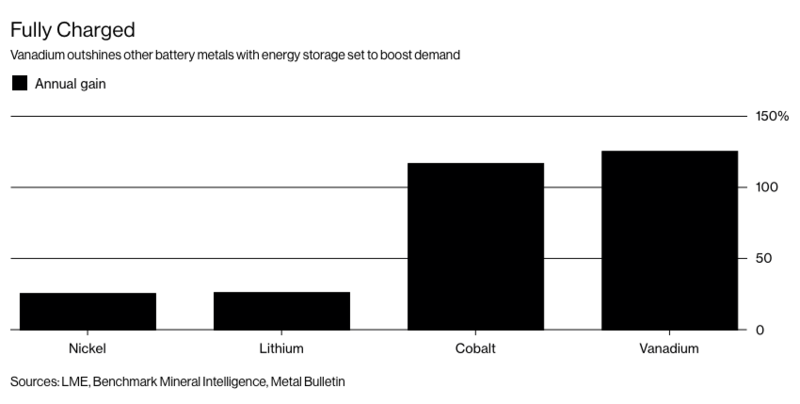 "It's no longer a technological maybe," says Matt Rhoades, president and CEO of United Battery Metals, a Colorado vanadium explorer sitting on one of the few known sources of the next big battery metal in the entire United States. Rhoades should know … his company is behind the discovery that hopes to put America definitively on the vanadium map. UBM's Wray Mesa Project in Colorado has a mineral resource base estimate indicating resource of around 2.7 million pounds of vanadium—not to mention all the uranium they already know is there for additional upside. "Vanadium is here, and lithium is scared because the $13-billion energy storage market has already found its new poster boy," Rhoades told Oilprice.com. The truth is that it's been a long road for vanadium to not only break into the energy storage market, but to actually become the future of the energy storage market. The next ‘moment' will be when someone in the U.S.—always one step behind the Chinese—announces plans for an American vanadium battery gigafactory. Anyone who hasn't gotten in before that moment will be nursing their lithium hangover. China is already building the world's largest vanadium flow battery (VFB) gigafactory in Dalian, with the massively powerful (200MW/800MWh) batteries to be manufactured by Rongke Power. And this year is the kicker. In just the past month, ferro vanadium prices have soared 33%. A month ago, ferro vanadium prices were at $79 per kilogram. Now we're looking at $105 per kilogram. And it's vanadium pentoxide that is the main ingredient in vanadium redox flow batteries used for grid energy storage. If you were just getting the hang of lithium and cobalt in the battery mix, vanadium might sound complicated—but it's not. It's as simple as size. This is where we get to scale up because when it comes to energy storage, bigger is better. In fact, bigger is the only way forward in this game. We're talking tanks that can be as big as you want them: an aquarium, a shipping container or even an Olympic swimming pool—as big as your imagination can take you. Vanadium is superior to lithium in every way. Not only does it have eternal life (unlike lithium), it's not explosive, flammable or toxic. Not only can it be scaled up cheaply, but it's actually cheaper to scale it up, making it the antithesis of lithium. Put in another way: It's tough to scale up a lithium-ion system. If you double the size, you double the cost. Not so with vanadium: All you have to do is make the tank bigger, and the bigger the scale the lower the cost. A lithium-ion battery gigafactory couldn't come close to this fast-paced cost reduction. Even though this is the biggest energy story right now, vanadium isn't just a bet on batteries—that's why Mining.com calls it "the metal we can't do without and don't produce". Just as UBM's new vanadium discovery is also an original uranium resource, vanadium can also be used in nuclear energy. By 2025, analysts estimate that 85 percent of all vehicles will incorporate vanadium alloy to reduce their weight and increase fuel efficiency. "If a vanadium battery producer steps forward with bold plans to produce vanadium flow at mass scale, giving the industry its Elon Musk or lithium ion moment, the potential for the technology to be the second most deployed ESS battery in the world is there," says Simon Moores of Benchmark Mineral Intelligence, a battery materials research and price discovery provider out of London. Rhoades certainly agrees and UBM is in that wonderful position of potentially becoming the only American source for the key rare earth metal that will power our scaled-up "liquid electricity" breakthrough. "The vanadium flow battery scale-up for massive energy storage makes the electric vehicle push look like child's play," he said. "Lithium was a teaser. Vanadium is where it all gets huge." Tesla's electric cars will eventually be more profitable than traditional cars, and easier to produce. Costs will keep coming down, especially now that Tesla's has launched its battery gigafactory in Nevada, and when it gets battery (and lithium) prices down. General Motors (NYSE:GM) is a household name. GM was born at the turn of the 20th century and has been a leading innovator in the automotive industry ever since. Even though it's been surpassed in market cap by Tesla (of all companies), it is still the furthest ahead of the Big 3 car makers from Detroit in terms of EVs and self-driving cars. FMC's involvement in the lithium industry is particularly notable. The company is one of the top three in lithium and associated technologies. And recently, the company announced that it will be launching a new company, Livent, which aims to raise $100 million in an initial public offering to establish its place as a dominant lithium supplier. This article contains forward-looking information which is subject to a variety of risks and uncertainties and other factors that could cause actual events or results to differ from those projected in the forward-looking statements. Forward looking statements include that United Battery Metals has a vanadium resource that it can economically mine, and that vanadium will be a key element in future energy storage. UBM may not be able to mine its resource, even if a substantial resource is verified on its property, as a result of lack of lack of funds, lack of permits, labor or equipment, environmental issues may arise to block mining, and there may not be economically viable way to mine the resources there. The type of vanadium on UBM's property may not be the right type for maximum energy storage. In energy storage, other technologies may become better, cheaper, more available or simply become the standard in the industry. Vanadium storage batteries may never achieve their hoped for success. Other sources of vanadium may become plentiful and therefore much cheaper than expected. PAID ADVERTISEMENT. This communication is a paid advertisement and is not a recommendation to buy or sell securities. Oilprice.com, Advanced Media Solutions Ltd, and their owners, managers, employees, and assigns (collectively "the Company") has been paid by the profiled company or a third party to disseminate this communication. In this case the Company has been paid by United Battery Metals fifty nine thousand two hundred and eighty six US dollars for this article alone as part of a media marketing campaign which also includes other articles. This compensation is a major conflict with our ability to be unbiased. This communication is for entertainment purposes only. Never invest purely based on our communication.